Two seasons ago, the dominant run of 25 straight league championships by the St. John Bosco Braves Cross Country team was snapped with a disappointing 6th place league finish. Last season, the Braves showed resilience, yet came up short; finishing 2nd place in the Trinity League. The cross-country program at Bosco can be viewed as one of the greatest programs of any sport in Trinity League history. Finally, this season, dominance has been restored in the league, as the Braves took first place back, marking the beginnings of a new streak for several years to come. This team brought a lot of talent win a league championship this year. Colby Corcoran, Albert Serrano, Diego de la Torre, Diego Gonzalez, and Raymond Solorza were part of a strong group of senior runners that lead the way all season for the team. Zeke Delgado, a junior, and Gabriel Cordova and Alexander Frias, both sophomores, were a big part of the team’s overall success this season as well. On November 3rd in Central Park, California, the Braves dominated the rest of their league in the Trinity League Finals, taking back the league championship with an 11 point victory margin over second place Mater Dei. de la Torre, Corcoran, and Serrano all were top 10 finishers in the race, guiding the Braves to a league title. Gonzalez and Delgado also earned top 20 finishes in the race, showing the importance of the well-rounded team the Braves had. Following this race, the team took 3rd place in the CIF Southern Section Division 3 Finals, and ended up finishing 9th place in the entire state of California for the State Finals on November 25th, 2017. Unfortunately, the downside of this historic season coming to an end will be having to wave goodbye to many of the senior leaders on the team. In order to keep up the grind to continue a new “streak,” many underclassmen and juniors will have to step up and get the job done in the coming years. In the end, however, this season will always be remembered as a special one for the St. John Bosco Cross-Country team. 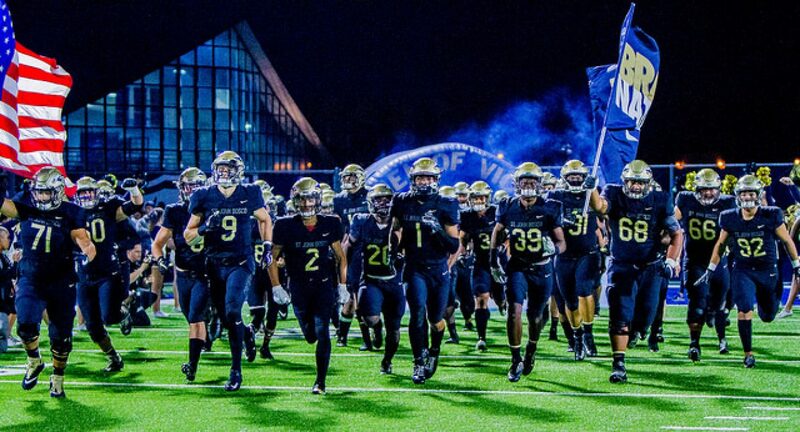 Hard work, dedication, and commitment to each other got the job done for the Braves, as they restored their rightful dominance in the Trinity League. Bosco Cross-Country is back.